Cook Time: 1 hour 20-25 min. I figured it was time to actually make my very own cheesecake with my and Zo's taste buds in mind. Before I had always based my version off of Rafe's Cheesecake. I still am influenced by that cheesecake of course but I really decided to take a step back and rethink the whole process. Especially the process of baking the cheesecake and avoiding cracks. 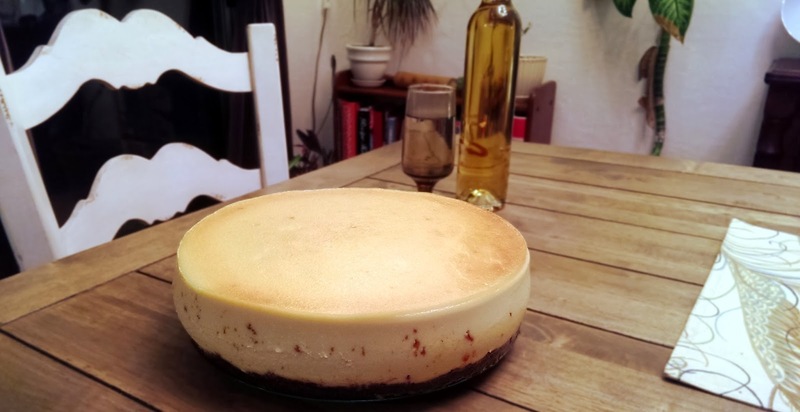 So I did some research and below you will find how I kept my cheesecake from cracking. Enjoy! Place a spring for pan on two heavy duty sheets of a spring form pan. Mold sheets to side of pan. Tear off a sheet of heavy duty aluminum foil that is the length of the circumference (plus 1 inch) of your spring form pan. Fold sheet to the height of your spring form pan and then wrap the side of your spring form pan and fold edges together. (This is later going to help keep your cheesecake from cracking.) Butter the inside of the pan with 1/2 tsp of butter. Melt chocolate chips, cream and butter in a small dish. Mix melted chocolate with the remaining crust ingredients in small mixing bowl. Pour into 9" spring form pan, pressing into place with your finger tips. Chill in refrigerator for 15 minutes. In a large mixing bowl beat together powdered sugar, marscarpone and cream cheese until softened and well blended. Gradually add sugar until a smooth mixture is formed. Continue to blend while drizzling honey into mixture until smooth. Add flour, salt, vanilla and lemon juice. Add 1 egg at a time, beating until smooth. Fold in sour cream until well blended and pour mixture into the pan over the back of a big spoon, so the batter does not disturb the crust. Let it rest for 5 or 10 minutes. Place aluminum foil wrapped spring form pan in a baking dish with enough water to come up to 1/2-1 inch the side of your pan. Place in oven on the middle rack and bake at 500 degrees for 12 minutes. Turn temperature down to 250 degrees for 60-7 minutes. (Never open the oven!) Turn the heat off and let cool for 1 hour. Remove from oven, remove from baking dish with water and let cool on a cooling rack for 1 hour, cover, move to refrigerator and chill for 5 to 6 hours. I hope you'll be making this for me soon!